This past Saturday night, more than 40 graduates of the "La Nueva Siembra" training program celebrated the tenth anniversary of GrowNYC’s New Farmer Development Project. “There were 75 total guests, with 8 current farmers and more than 40 graduates from La Nueva Siembra, including 5 participants from the most recent 2010 class," reported Chris Wayne, NFDP Coordinator. Special guests included both the founding director of the project, Rachel Danifer, and the previous director, Kate Granger. Also in attendance were long time Cornell Cooperative Extension agent and NFDP training specialist John Ameroso and his wife Linda. Nestor Tello, an egg and chicken producer from Dutchess County, was the winner of the evening’s raffle and took home a broadcast seeder and a 50lb bag of cover crop seed. He hopes to use the seed on a new piece of property that he is in the process of acquiring in Greene County. All Saturday Greenmarkets will be closed on Saturday, December 25 and Saturday, January 1. The schedule for Sunday Greenmarkets, effective December 26 and January 2, is below. There will be no textile collections at any market on December 24-26, December 31, and January 1-2. Dreaming of a Green Holiday? 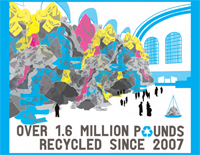 As we slow down to celebrate another year with friends and family, the flow of waste seems to speed up. Egg nog cartons stack up on the counter, wrapping paper litters the living room, ugly sweaters spill out of drawers and not-so-obsolete electronics are transformed into pricey paperweights. 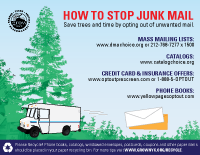 We’ve compiled some of our favorite tips to help you reduce waste and clear out clutter without clogging a landfill. Even Grandma’s greeting can go to a good cause. Read more about Dreaming of a Green Holiday? 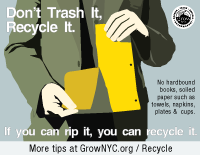 Ever wish you could do more to educate your neighbors or tenants about recycling and waste prevention? 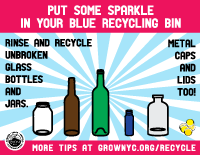 Check out this series of recycling posters from GrowNYC’s Office of Recycling Outreach and Education. 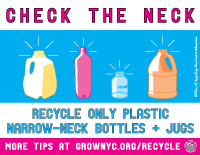 Download the poster of your choice in black & white or color, print and post in recycling rooms, lobbies or other common areas of your building. 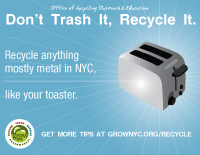 A new poster is issued each month in OROE’s NYC Recycling Updates e-newsletter. GrowNYC's Thanksgiving Produce Bags were a big hit this year, distributing close to 2,000 lb of fresh, local produce to Harlem residents for the holiday. $4 produce bags filled with 5 pounds of seasonal vegetables like sweet potatoes, carrots, and collard greens were sold at four locations throughout Harlem. Thanks to all our partners and volunteers who made it possible! See you next year. Recently, the roof on the stage/gazebo at JDD Garden had fallen into disrepair. In addition to providing gardening space for some of our Learn It, Grow It, Eat It students, the garden plays host to community events, meetings, and parties, so a solution was needed. Thanks to generous support from Morrisania Revitalization Corp. and BASICS Inc., GrowNYC has spent the last month demolishing the old structure and building a new one, suitable for performances, shaded sitting, and a new rainwater harvesting system. GrowNYC staff was assisted by volunteers from BASICS and the Sustainable South Bronx Best Academy.